Interactive Map Location of Satellite Corps in [[Torren. The Satellite Corps building is a four-story tower located in the southeast of Route 15. Though its service to the region isn't very clear, it is revealed later in the game that its true purpose is to contain a powerful monster inside using the electrical energy it produces. Though completion of the Satellite Corps building is not mandatory in order to complete the game, there are a few notable prizes that the tower provides to the player for taking the time to complete the various puzzles involved. The player's first visit to the Satellite Corps building requires that they scale up the tower in order to find the creature that is wreaking havoc on the tower's electrical equipment. 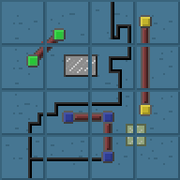 Starting on the second floor and continuing up until the fourth floor, the player is required to solve three circuit puzzles in order to access the rest of the tower. 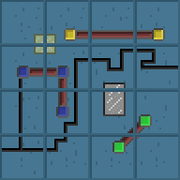 These puzzles are solved by reconnecting the circuits that were fried in each of the electronically powered doors, which is done by moving the tiles corresponding to the different parts of the circuit and placing them in their correct positions. Images of each of the completed puzzles can be found at the bottom of this page. 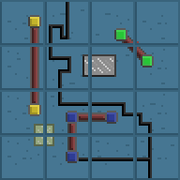 Starting on the third floor and continuing up until the fourth floor, the circuit puzzles also require the player to rotate each of the pieces using the Z or Shift keys before putting them into their correct positions. A simple way of identifying if a piece needs to be rotated is to check and see if the tile's edges appear to be crooked or jagged; correctly rotated pieces will contain edges which are perfectly straight. After completing the puzzle on the fourth floor, the player will be able to battle and capture the Pokémon responsible for the chaos within the tower. Returning to the scientist after subduing the creature will result in the player receiving a Water Stone for their efforts. 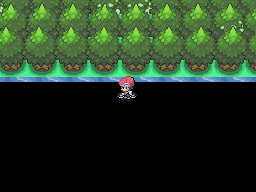 After giving the Sinnoh Visa to the scientist outside, the player will be able to unlock the door on the ground floor using the Basement Key and access the lower levels. Continuing down these floors gives access to a battle with a legendary Pokémon.